Applications for the NDA's 2014 Environmental Excellence Awards were mailed to every Association member. This program, designed to promote the demolition industry’s commitment to environmental stewardship as outlined in the organization's mission, has been very successful with both members and their clients. These awards are presented to NDA members that perform projects that have a significant impact on the quality of life in the community where they did the work or developed a product or service that does the same. Applications for next year's awards are due at NDA Headquarters in Doylestown, Pa., on Monday, Dec. 16. Click here to fill out your application online today! There are still a number of excellent sponsorship opportunities available at the NDA's 41st Annual Convention at The Mirage in Las Vegas, Feb. 22–25. Items and events such as the tote bags and three coffee breaks as well specific opportunities to sponsor individual speakers or the NDA's Leadership Development Training Program on Sunday, Feb. 23 are still available for sponsorship. The NDA is also interested in any ideas potential sponsors may have about new initiatives or items they would like to sponsor. For more information about sponsoring an item, session, or event at next year's Annual Convention contact NDA Headquarters at 1-800-541-2412. 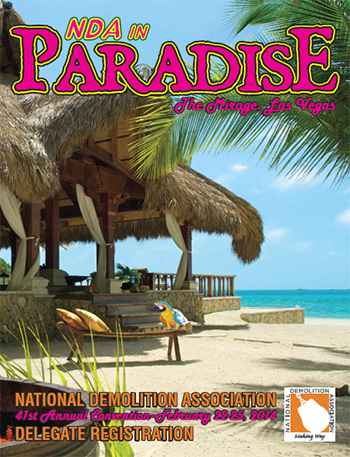 Don't miss this great opportunity to support the National Demolition Association and its programs. The deadline to take advantage of a $50 saving on the delegate registration for the NDA's 2014 Annual Convention at the Mirage in Las Vegas, Feb. 22–25,is fast approaching. The NDA's early bird registration fee is $650 until Saturday, Jan. 11. This year's 41st Annual Convention features Former Energy Secretary Stephen Chu as the keynote speaker as well as a session on understanding "Obamacare" and a special Leadership Training Institute. Register early to take advantage of the early bird savings. NDA Board to meet in Vancouver, British Columbia, and Gettysburg, Pa.
NDA President Jeff Kroeker — of Kroeker, Inc. in Fresno, Calif. — has announced the dates and locations for the first two Board of Directors' meetings in 2014. The Association's Board will hold its summer meeting at the Pan Pacific Hotel in Vancouver, British Columbia, on June 6-7 immediately following the NDA's Southern California Chapter's 25th "Silver Anniversary" Golf Tournament to held on June 4-5 at the Palm Pacific Resort in City of Industry, Calif. The NDA's Board Meeting in the fall will be held at the historic Gettysburg Hotel in Gettysburg, Pa., on Sept. 26-27. The hotel was the site of fierce fighting on the first day of the historic battle in Gettysburg in July, 1863. A cannonball from this fighting remains in one of the hotel's exterior walls. The fall Board meeting will also include a tour of Volvo Construction Equipment's new North American headquarters and assembly plant in nearby Shippensburg on Sept. 26. Does your company need leadership development training? As part of the Association's Education Initiative, the NDA's 41st Annual Convention will feature a full-day Leadership Development Training Program designed for project managers, estimators, superintendents, foremen and company owners, anyone who benefits from improving their leadership skills. The interactive curriculum, presented by FMI, one of the nation's leading construction management consulting firms, will include sessions such as: Leadership v. Management; Managing Up & Down; The Leader's World View: Who am I as a Leader & Why Does it Matter? ; Time Management and Purposeful Delegation; and Action Planning. The program is designed to provide the attendee with a better understanding of who he/she is as a leader, insights into how leadership skills can move a project forward and save your company money, and learning how to be more effective and efficient. This exclusive program is limited to 30-35 attendees. The cost for this Leadership Development Training Program is $250.00. Attendees will receive a discount in their delegate registration for the NDA's 2014 Convention. For more information contact NDA headquarters at 1-800-541-2412. Turn your holiday shopping into reward points! Saving money isn't the only benefit of shopping holiday deals. With AchieveLinks®, you get the added bonus of Links® Reward Points that you can redeem for more great gifts or even something special just for you. And since most retailers extend holiday savings to their online stores, you can shop through AchieveLinks and earn Links from the comfort of your home. In response to every survey we've conducted over the years, hiring managers and business owners report that employee referrals generate the best job applicants. These results are also right in line with independent studies. The deadline to take advantage of a $50 saving on the delegate registration for the NDA's 2014 Annual Convention at the Mirage in Las Vegas, Feb. 22–25,is fast approaching. Applications for the NDA's 2014 Environmental Excellence Awards were mailed to every Association member. Click here to fill out your application online today! A series of deadly earthquakes that shook New Zealand in 2010 and 2011 may have weakened a portion of Earth's crust, researchers say. New Zealand lies along the dangerous Ring of Fire — a narrow zone around the Pacific Ocean where about 90 percent of all the world's earthquakes, and 80 percent of the largest ones, strike. A circular tower is one of four Astrodome ramp towers scheduled to be demolished on Dec. 8. A Los Angeles City Council committee agreed recently to push forward a proposal to identify all the apartment buildings in the city that have a certain type of wood frame that is vulnerable to collapse in a major earthquake. Reporting to a City Council planning committee, Ifa Kashefi, chief of the engineering bureau at the Department of Building and Safety, laid out a plan to winnow out these so-called soft story wood-frame buildings among the 29,000 apartment buildings across the city that were built before 1978. In response to every survey we've conducted over the years, hiring managers and business owners report that employee referrals generate the best job applicants. These results are also right in line with independent studies that show employee referrals are the only recruiting tool that delivers high-quality workers who stay on board about three times longer than those from other sources. And the best way to generate employee referrals is to set up an employee referral reward system. The city of San Francisco, through 1st Capitol Auction will auction off its asphalt plant on Dec. 17. There is no minimum and no reserve auction. 1st Capitol says that the high bidder will own the plant. What if concrete can be made ductile? The most important concrete property in the ACI 318 Building Code is compressive strength. This reflects the notion of using concrete as a strong material against compressive stress in structural members. Tensile forces are expected to be carried by pre-stressing or reinforcing steel. These fundamental structural design concepts of putting concrete in compression and steel in tension have largely worked very well. In recent years, the increasing attention to the need for structural resiliency and environmental sustainability has shed new light on the limitations of concrete material. While setbacks and delays are common in the construction industry, certain projects stand out from the rest of the pack for the sheer amount of time and money they needed to finally reach completion. Here are eight of the world's most costly and time-consuming construction projects — some of which still remain unfinished — arranged in order of the number of years it took to bring them to fruition.